I saw this back in June and meant to post the photo. I think this defines Chicago and the dichotomy of architecture in the city. The project I was on is to my right, out of sight. This is in the Old Town neighborhood, so named because it was a location for original immigrants to the city. 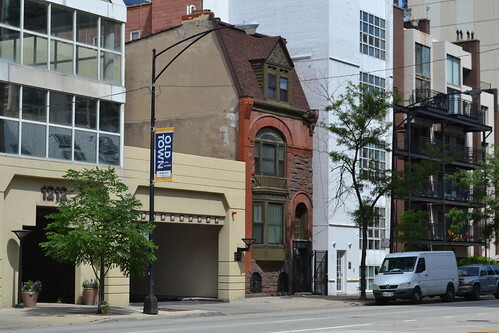 It suffered the effects of the Chicago fire and many of the streets and alleys do not conform to the city's grid pattern. They were paths to get from the Chicago River, on the south, toward the northern suburbs. After the fire, the area was cleared and many of Chicago's more well-to-do people built grand Victorian homes in this neighborhood. I don't remember if the home has a plaque on it designating the year it was constructed. Many of the Victorian homes around here do have such designation. That is, however, the proverbial double-edged sword. While you have an architectural gem, you have to be careful what you do with it if you want to keep that designation. The external character of the home has to be preserved while you try to upgrade wiring that may not have seen a formal electrician since the mid-1970's. Sadly, it's often better to raise the building than remodel it. And there is "progress" of course; the need for new buildings meeting the desires of tenants and owners of the properties. We can lament all we like about the loss of such a building with its connection to history and its character, but, again, the reality of sinking money into the restoration of an over 100 years-old house versus selling the land and raising the structure can lead to the latter, rather than the former. The lack of windows on the south side of the building leads me to believe this is the last of a series of row homes. This is the reality of building in a city. You must utilize all available space, which means building lot line to lot line. There would have been a yard in front of the home and a back yard. The front yard has long been claimed by the street and there was just a small strip of mulch where flower pots sat. I don't remember if this was a multi-family or single family building and I'm also unsure if this design would have been single family back at the time of its construction. Apartment buildings are not a new concept. Given the design of the building, I'm leaning toward a row of these from the corner, out of sight to the left, and working north; all of them single family units. I can almost hear the bustle of dresses as the home's occupants left for work or the day's activities. It's wonderful that property owners decided this would not fall to the wrecking ball. While we can't save everything because some properties just can't be repaired to be useable, this example of what the neighborhood was at the end of the 19th and beginning of the 20th century reminds me that Chicago has always been a dynamic city. Past and present can coexist, comfortably.